It’s March, which brings the most exciting and hectic time of the year. Today, we look at the SEC matchups in Round 1 of March Madness and make our picks! It’s that time of the year again, folks, which means that March Madness is back! Sixty-four teams have received a bid to play for the National Championship, and the quest for that title starts today! Seven Southeastern Conference teams have made the Big Dance, including the Ole Miss Rebels! The Rebel Walk team has made our picks for each SEC game in the Round of 64! Here is the schedule for each game. Here are our picks for each of this weekend’s upcoming SEC games. Give us your feedback on Twitter @TheRebelWalk and Facebook, and let’s talk SEC basketball! Hotty Toddy! Jake Evans: With head coach Will Wade, LSU is a very good team. Without Will Wade, we’re still unsure. The Tigers thumped Vanderbilt in their final regular season contest, but that means little to nothing because Vanderbilt was 0-18 in SEC play. LSU then lost in the first round of the SEC tournament as the No. 1 seed. However, I do think LSU beats Yale in a close game, but I don’t see them going much further without their head coach. Evie Van Pelt: This will actually be Yale’s second NCAA tourney appearance in the last three seasons. The Bulldogs upset Baylor as a 12-seed in 2017, before coming oh-so-close to shocking Duke in the second round. The Bulldogs boast the Ivy League Player of the Year, Miye Oni, who averages 17.6 ppg, and they also have three other players who average double-digit points per game. Ultimately, however, none of that matters as LSU (NET ranking of 14) will be too strong inside for Yale (NET ranking 86). LSU wins and covers. 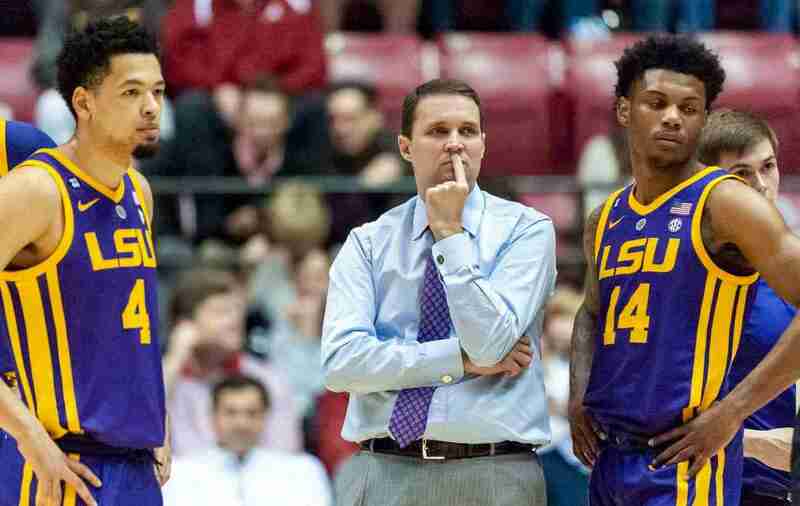 Ross Montgomery: I am tempted to pick Yale to upset a Will Wade-less LSU, but I believe the Tigers will be too much for the Bulldogs. LSU wins in a close one. Jake: Two months ago, Auburn looked like it could make a run in the tournament. Then, after the Rebs beat them in January (Ole Miss also beat them a second time in February), the Tigers went on to lose three of their next five. Now they’re red hot again, coming off an SEC tournament championship win where they smacked Tennessee by 20. The fact that they’re up and down scares me a bit, but they’re feeling good right now. They’ll take care of business in Round One, and most likely face Kansas in the Round of 32. Evie: Auburn is one of the hottest teams in the country right now. However, the Tigers’ first-round opponent, New Mexico State, is interesting. The Aggies, who won the WAC Tournament and are also regular-season champions, have incredible depth. They run 13-deep and can substitute “platoon style.” New Mexico State has 11 upperclassmen who provide a lot of maturity for the team, and their bench has allowed them to boast a plus 9.6 rebounding margin per game. The Aggies will be battling history, though, as they have made consecutive opening-round exits in the NCAA Tournament. 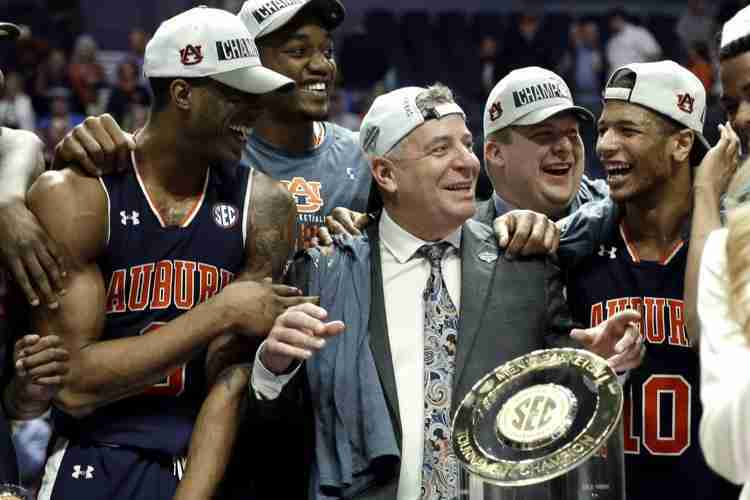 This will be their 12th straight as Bruce Pearl and Auburn win this one–but they won’t cover the spread. Land: Auburn is playing its best basketball of the season and it couldn’t have come at a better time. Fresh off winning the SEC championship, the Tigers are lookin to prove themselves in the Big Dance. If they shoot as solidly as they are able to, they could be a tough team to beat…Auburn wins this one. Ross: Auburn is hitting on all cylinders right now. I believe Bruce Pearl will lead this team on a deep tournament run. Tigers win. Jake: Florida has shown flashes of progress this year, but I think Nevada is a flat-out better team. The Wolf Pack have four players averaging double digits and are outscoring their opponents by an average of 14 PPG. Nevada shoots nearly 47% from the field, and 35% from three, and they out-rebound their opponents nearly every night. I don’t see Florida being able to hold up against Nevada, especially if the Wolf Pack start hitting shots. Evie: The Gators (NET 31) have height, but they are mostly a guard-oriented team who can shoot from three. They do have a very solid defense—they are ranked No. 14 nationally in defensive efficiency—but they don’t rebound well. Florida only has one player, senior guard KeVaughn Allen (12.0 ppg), who is averaging in double figures. Nevada (NET 23), on the other hand, will likely pound the Gators on the boards. The Wolf Pack move the ball around well and are a very big, very experienced team with veteran upperclassmen. They do best with an up-tempo game, so the Gators will definitely try to slow things down. In the end, I think Nevada has too much depth and experience, returning many of the players off last year’s team that lost in the Sweet 16 round by one point. I think Nevada wins this one. Land: Florida is a tough team to nail down. One second they are knocking off LSU–and the next they are getting beat by Georgia. To be honest, I don’t trust this Florida team. A 7 vs. 10 matchup is always a toss-up, but I’m going with Nevada. Ross: Florida played well in the SEC Tournament last week, and I think it will carry over to the NCAA Tournament. Mike White leads the Gators to victory. Jake: Kentucky. By a lot. Evie: Kentucky will likely cover the 21.5 spread as this one won’t even be close. Land: Kentucky is for real…so, you know, they win. Jake: Of the seven games with SEC teams in this year’s tourney, the Rebs are the most evenly matched with their opponent. Both teams shoot the ball almost identically and rebound as poorly. The Sooners have lost 8 of their last 12, and I really don’t see why they’re playing in March, to be completely honest. Ole Miss will win the game if the Rebels drive to the basket and get to the free throw line. Ole Miss is 3rd in the NCAA in FT percentage…OU is 231st. It’s imperative that the Rebels get Oklahoma in foul trouble early and often. I think the Rebels’ guard play with Terence Davis, Devontae Shuler, and Breein Tyree will make the difference, and the Rebs will win a close one. Evie: Ole Miss (NET ranking 36) is coming off a disappointing loss to Alabama in the SEC tourney. Normally, that might be a negative entering the Big Dance. However, I look for Breein Tyree and Terence Davis to bounce back from that loss with a vengeance. Against the Tide in the SEC Tournament, the two star guards were a combined 4-27, and I just don’t see that happening again. T.D. is one of the best to ever wear an Ole Miss uniform–and the senior is not going to close out his career without a fight. Breein Tyree said he felt personally responsible for the loss to the Tide in what he described as his worst game as a Rebel. The great ones, like Tyree and Davis, bounce back, and I think they will do that in Columbia. OU (NET ranking 37) is quite good on the boards, and the Sooners also guard very well from three. But, offensively, they just don’t move the ball around well, and they don’t make much from beyond the arc. They also don’t force enough turnovers. 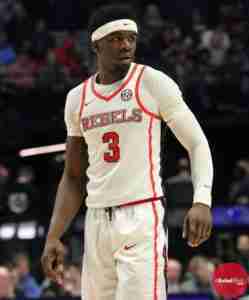 If Davis and Tyree have a good game and stay out of early foul trouble, the Rebels win and live to fight another day. Land: As impressive as it is that Ole Miss is in the tournament in Kermit’s first year, the Rebs have had a tough time closing in big games. I think Ole Miss and Oklahoma match up well; both were a 7-seed in their respective conference tournaments, and both lost to a No. 10 seed in the first round. If Ole Miss wants to win, TD and Tyree have to play better than they did in their short time in Nashville at the SEC Tournament. Not only that, but the Rebs have to close–something they don’t do very well. As much as I want to pick the Rebels, I think the Sooners steal this one in another close game heartbreaker. Ross: As Jake said, Ole Miss and Oklahoma are pretty evenly matched on paper, but the guard play of the Rebs will be the difference in his game. Terence Davis and Breein Tyree have something to prove after the 2nd-half SEC Tournament debacle. Kermit has surpassed expectations in his first year at the helm, and I believe he will continue to do so. Rebs win, and will more than likely match up with Virginia on Sunday. Jake: Tennessee is a very good basketball team, despite losing by 20 last week in the SEC Tournament Championship. Grant Williams is up for Naismith Player of the Year; Jordan Bone is one of the best point guards in the NCAA; and Admiral Schofield is absolutely electric. Vols take this one easily. Evie: Tennessee (NET ranking 5) is coming off an 84-64 pounding at the hands of Auburn in the SEC Tournament Championship. But the Vols’ size, talent and experience mean they will have put that last game behind them and will be looking to make a deep run in the Big Dance. They’re strong in transition, they move the ball around well, and they are great on the boards. They are good from the free throw line and don’t make a lot of mistakes. Colgate (NET ranking 132) will have its hands full with Tennessee. The Raiders, who tied for the Patriot League regular season title, are on an 11-game winning streak. That comes to an end against the Vols. I expect Tennessee to win big. Land: Tennessee gets back to winning vs Colgate. Ross: Vols by a lot. Jake: No bias here, I legitimately think Liberty will beat the Bulldogs in this game. During the Selection Show last Sunday, analysts immediately pointed this game out as an upset alert. I agree. Liberty has won 18 of its last 20, while State has limped into March, losing 3 of its last 5. I haven’t been impressed with the Bulldogs in a while, and I think this game has all the characteristics of a glorious bracket buster. Evie: I look for Mississippi State (NET 19) to beat Liberty (NET 58), but I think the Flames will give the Bulldogs all they can handle. Liberty has really good outside shooting that will cause State some trouble, but the Bulldogs will dominate on the boards. I just don’t think the Flames’ offense will be able to do enough inside to win this game. State wins, but they won’t cover the spread. Land: As much as I’d like to see Liberty get the upset, I just think the Bulldogs are too athletic and will take care of Liberty. How great would it be if I were wrong! Ross: I hate to ever pick the Bulldogs, but I just don’t see them losing to Liberty. State wins this one. There you have it for The Rebel Walk’s Roundtable Round One SEC Picks! Let us know what you think will happen this weekend, and start the conversation with us on Twitter (@TheRebelWalk) and Facebook!